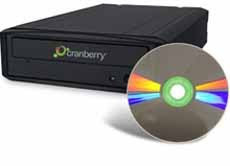 Startup company Cranberry has unveiled its DiamonDisc: a DVD that stores your data by etching it in stone... literally. The disc is composed of synthetic stone that a high-intensity laser burns the data into, creating a DVD said to be perfectly compatible with all DVD drives and players. But amazingly, Cranberry claims that the DiamonDisc will keep your data safe for a thousand years. You can send your data to Cranberry to have it burned by them. Or you can buy the DiamonDisc recorder for your own use, for the low price of $4,995. But that also gets you 150 DiamonDiscs that currently run $34.95 each when bought separately.